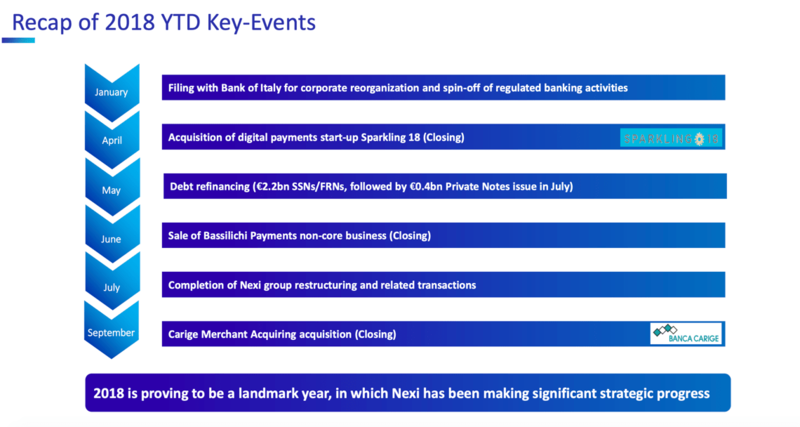 The paytech company Nexi filed for admission to listing on the Italian Stock Exchange. The launch of the offer is scheduled for April 2019 (see the press release here), as planned (see here a previous post by BeBeez). The offer of Nexi is reserved to qualified investors in Italy and institutional investors abroad will be a mix of both a capital increase for 600-700 million euros and sale of shares by the shareholders. It has not been communicated how much the float will be, but it is said to be at least a 35% stake. As for the valuation, we are talking about 6.5-7.5 billion euros, including the net financial debt of around 2.5 billion euros. The start of the ipo route was officially given last January (see here a previous post by BeBeez), with the appointment of Evercore as financial advisor, while Banca IMI, BofA Merrill Lynch, Credit Suisse, Mediobanca and Goldman Sachs were appointed global coordinators and joint bookrunners, and Banca Akros, Barclays, Citigroup, HSBC, MPS Capital Services, UBI Banca, UBS and UniCredit that will act as joint bookrunners. Furthermore, Banco Bpm will act as a hypo credit facilities coordinator, while UBI Banca is the credit rating advisor of the loan agreement that will be signed at the same time as the completion of the ipo, in order to refinance the residual debt at the best conditions. 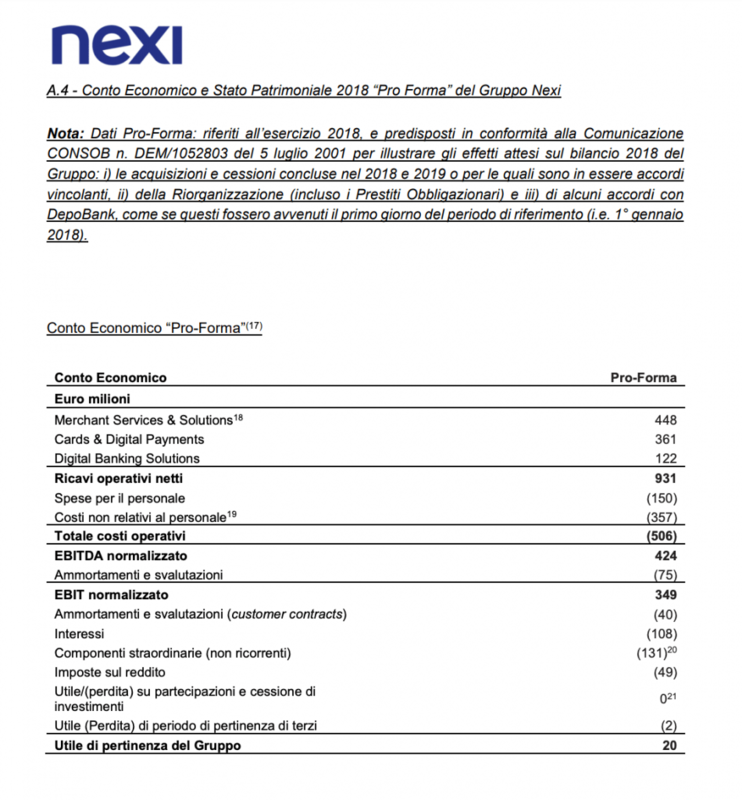 The income deriving from the capital increase will in fact be used by Nexi mainly to reduce the group’s financial debt, with the aim of reaching at the end of 2019 a ratio between net financial debt and normalized ebitda between 3 and 3.5 times . Nexi is controlled today at 93.2% by Mercury UK Holdco Ltd, the vehicle owned by the private equity funds Bain Capital, Advent and Clessidra, and is owned for the rest by a dozen of credit institutions, including Banco Bpm , Credito Valtellinese and Popolare di Sondrio holders of shares over 1%. The perimeter with which Nexi will land on the stock exchange is very different from the one pictured by the group’s financial accounts of 2017, because last July the Nexi group split into two: on the one hand DEPObank where all securities services and intermediation services that require a banking license (custodian bank) were merged and, on the other, the new Nexi Group, formerly Mercury Payment Services (ex Setefi Payment Services), which incorporates all payment activities and companies group subsidiaries focused on payments (see here a previous post by BeBeez). Moreover in the last year the group has conducted acquisitions (the one of Sparkling18 and the one of the activities of card merchant acquiring of Carige) and sales (of HI-MTF and of some real estate assets), moreover continued in these early 2019, with the sale of Oasi to Cedacri (see here a previous post by BeBeez) and PayCare (established in November 2018 with the transfer of some assets of the former Bassilichi) to Comdata (see here a previous post by BeBeez). Finally between May and July 2018 the group had refinanced the bonds listed on the Luxembourg Stock Exchange for a total of 2.2 billion euros and had issued 400 million of new bonds placed in private placement (see here a previous post by BeBeez). For this reason, the figures to be looked at are those of the 2018 pro-forma financial statements (see the press release here), to which the presentation of the nine-month accounts to analysts already referred last November. 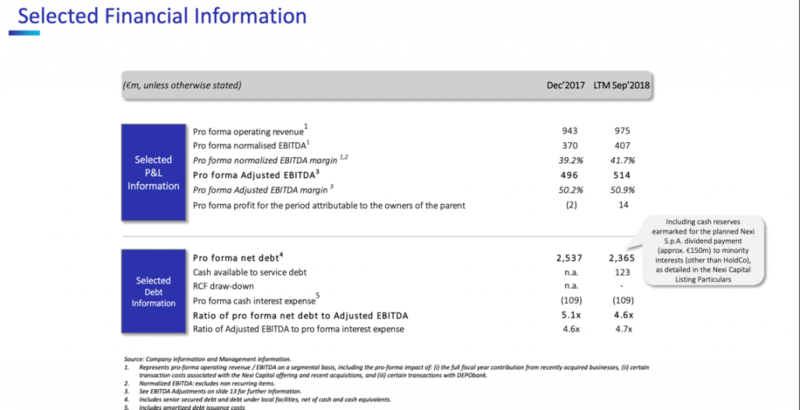 On the basis of pro-forma financial data, therefore, in 2018 Nexi recorded net revenues of 931 million euros and a normalized ebitda of 424 million, compared to 943 million of pro-forma net revenues and an ebitda of 370 million 2017. The management estimates that the benefit on the ebitda deriving from the various efficiency initiatives implemented in recent years, once fully implemented, will amount to 126 million per year, of which one portion of 31 million already realized during the 2018 financial year and therefore reflected in the financial data mentioned above. Therefore, as at 31 December 2018, the expected ebitda benefit from the Unrealized Initiatives is 95 million per year, a portion of which is expected to be realized in 2019 while the entire amount will be realized in 2020.